"Art Deco" Style Coastal Home with "5 Star" Furnishings etc (Area Special Silver Award Winner - English Tourist Board). 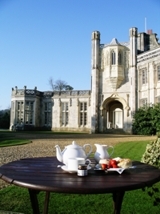 Situated in Highcliffe, Christchurch, Dorset. Close to Mudeford, Friars Cliff, and New Forest. Accommodation is Real Luxury "non-smoking" En-Suite Bedrooms, each with "Free and Private" breakfast room or conservatory lounge. Outside door entry to guests garden. Ample Car Parking. Choice of Organic Breakfasts in your own Private Breakfast room. Grilled (not fried) English or Continental. 5 Minutes to the New Forest, Wild Ponies, Deer and Great Walks (Mountain Bike Hire Nearby). Only a couple of minutes to Award Winning Highcliffe Beach (Christchurch Bay), which is the nearest Dorset beach to the New Forest. 15 Minutes to Bournemouth, and "All Year Round" Theatres, Shows, Big Stores, Designer Shopping, Night Clubs, Cinemas, etc..
Several Restaurants just 10 minutes walk away, plus Pubs and Bars. Central for Lymington (Town & Marina), Historic Christchurch, Bournemouth, Lyndhurst, The New Forest, Sandbanks. Tea House/Restaurant. Golf Course (open all year round) opposite. Ideal for visitors to Friars Cliff, Avon Beach, & Mudeford. From Mudeford Quay take a ferry to traffic free Hengistbury head, or to Christchuch. Probably England's mildest winter climate. 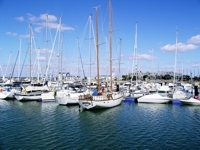 See the World's Second Largest Natural Harbour, with a "5 Island Boat Trip" around Sandbanks. Luxury for Business or Pleasure that gives Quality Hotel Style Facilities at B&B Prices!! ~ Special apartment accommodation, comprising two double en-suite bedrooms, with its own private lounge/conservatory, with organic breakfast included. Robert Dee’s hilarious past experiences of running a Hotel and daily ‘ Goings On'. All set around Dorset & The New Forest. Robert Dee’s very funny & crazy holiday experiences. It all started with the sniggering travel agent when making the booking to fly from Bournemouth to Kebabba Island! A further hilarious book by Robert Dee, all about Lord and Lady Fiddleswick, and the goings-on within their family home, where they seem to live in a by-gone era! SPECIAL OFFER: just £8.99 includes postage. Secure payment by card, or Cheque. To place your order ring: 01425-277171. A ~ Double Room, En-Suite, ‘FREE' Private breakfast area or Private conservatory lounge. Door to Garden. Note: All Public Holidays as July prices. Note: Sorry, no children. Deposit required. All bookings payments in full, but refundable up to three weeks before arrival, with notice. Any balance payment due on arrival. Rooms available from 4:00 pm - day of departure time 10am. Closed Christmas period and New Year. It is still quicker to make your reservations by telephone. 00 44 (0) 1425 277171 or 00 44 (0) 7885 186 015. Highcliffe near Christchurch has it all for that getaway break or holiday.